Readmission penalties on hospitals hit a new high in 2016, increasing by a fifth over 2015 numbers to $528 million. Changes in how the rehospitalization rate in calculated influenced the jump in penalties. But that's not the only factor capable of influencing 30-day readmissions: Patient engagement efforts often fall short, too. 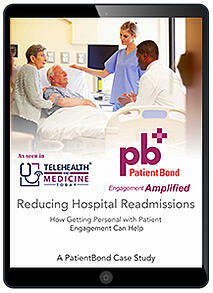 How can hospitals use patient engagement technology to change patient behavior and reduce readmissions? How a prestigious New England hospital system experienced just one readmission for a form of spine surgery and reduced nurse FTEs dedicated to patient follow-up by more that 75 percent after using PatientBond to establish a proactive, personalized patient engagement workflow.